Mount Athos (; Greek: Άθως, Áthos, [ˈaθos]) is a mountain and peninsula in northeastern Greece and an important centre of Eastern Orthodox monasticism. It is governed as an autonomous polity within the Greek Republic. 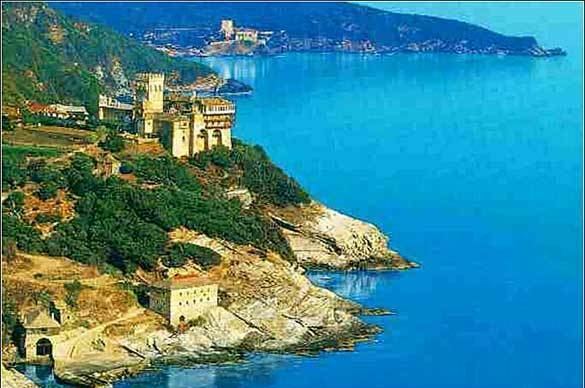 Mount Athos is home to 20 monasteries under the direct jurisdiction of the Ecumenical Patriarch of Constantinople. Mount Athos is commonly referred to in Greek as the "Holy Mountain" (Greek: Ἅγιον Ὄρος, Agion Oros [ˈaʝ(i)o(n) ˈoros]) and the entity as the "Athonite State" (Greek: Αθωνική Πολιτεία, Athoniki Politia). Other languages of Orthodox tradition also use names translating to "Holy Mountain" (e.g. Bulgarian and Serbian Света гора, Russian Святая Гора, Georgian მთაწმინდა). In the classical era, while the mountain was called Athos, the peninsula was known as Acté or Akté (Ἀκτή). Although Mount Athos is technically part of the European Union like the rest of Greece, the status of the Monastic State of the Holy Mountain, and the jurisdiction of the Athonite institutions, were expressly described and ratified upon admission of Greece to the European Community (precursor to the EU). The free movement of people and goods in its territory is prohibited, unless formal permission is granted by the Monastic State's authorities, and only males are allowed to enter. The peninsula, the easternmost "leg" of the larger Chalkidiki peninsula in central Macedonia, protrudes 50 kilometres (31 mi) into the Aegean Sea at a width of between 7 and 12 kilometres (4.3 and 7.5 mi) and covers an area of 335.6 square kilometres (129.58 sq mi). 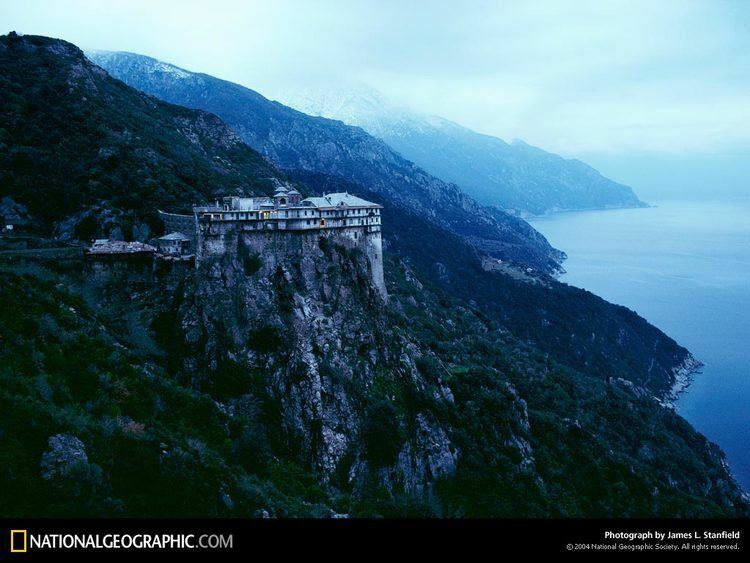 The actual Mount Athos has steep, densely forested slopes reaching up to 2,033 metres (6,670 ft). The surrounding seas, especially at the end of the peninsula, can be dangerous. In ancient Greek history two fleet disasters in the area are recorded: In 492 BC Darius, the king of Persia, lost 300 ships under general Mardonius (Herodotus "Histories" book VI (Erato), Aeschylus "The Persians"). In 411 BC the Spartans lost a fleet of 50 ships under admiral Epicleas. (Diodorus Siculus, "Bibliotheca historica" XIII 41, 1–3). The number of daily visitors to Mount Athos is restricted, and all are required to obtain a special entrance permit valid for a limited period. Only men are permitted to visit the territory, which is called the "Garden of Virgin Mary" by the monks, with Orthodox Christians taking precedence in permit issuance procedures. Residents on the peninsula must be men aged 18 and over who are members of the Eastern Orthodox Church and also either monks or workers. Homer mentions the mountain Athos in the Iliad. Herodotus writes that, during the Persian invasion of Thrace in 492 BC, the fleet of the Persian commander Mardonius was wrecked with losses of 300 ships and 20,000 men, by a strong North wind while attempting to round the coast near Mount Athos. Herodotus mentions the peninsula, then called Acte, telling us that Pelasgians from the island of Lemnos populated it and naming five cities thereon, Sane, Cleonae (Kleonai), Thyssos (Thyssus), Olophyxos (Olophyxis), and Acrothoï (Akrothoön). Strabo also mentions the cities of Dion (Dium) and Acrothoï. Eretria also established colonies on Acte. At least one other city was established in the Classical period: Acanthus (Akanthos). Some of these cities minted their own coins. The peninsula was on the invasion route of Xerxes I, who spent three years excavating the Xerxes Canal across the isthmus to allow the passage of his invasion fleet in 483 BC. After the death of Alexander the Great, the architect Dinocrates (Deinokrates) proposed carving the entire mountain into a statue of Alexander. The history of the peninsula during latter ages is shrouded by the lack of historical accounts. Archaeologists have not been able to determine the exact location of the cities reported by Strabo. It is believed that they must have been deserted when Athos' new inhabitants, the monks, started arriving some time before the ninth century AD. According to the Athonite tradition, the Blessed Virgin Mary was sailing accompanied by St John the Evangelist from Joppa to Cyprus to visit Lazarus. When the ship was blown off course to then-pagan Athos, it was forced to anchor near the port of Klement, close to the present monastery of Iviron. The Virgin walked ashore and, overwhelmed by the wonderful and wild natural beauty of the mountain, she blessed it and asked her Son for it to be her garden. A voice was heard saying "Ἔστω ὁ τόπος οὖτος κλῆρος σὸς καὶ περιβόλαιον σὸν καὶ παράδεισος, ἔτι δὲ καὶ λιμὴν σωτήριος τῶν θελόντων σωθῆναι" (Translation: "Let this place be your inheritance and your garden, a paradise and a haven of salvation for those seeking to be saved"). From that moment the mountain was consecrated as the garden of the Mother of God and was out of bounds to all other women. Historical documents on ancient Mount Athos history are very few. It is certain that monks have been there since the fourth century, and possibly since the third. During Constantine I's reign (324–337) both Christians and pagans were living there. During the reign of Julian the Apostate (361–363), the churches of Mount Athos were destroyed, and Christians hid in the woods and inaccessible places. Later, during Theodosius I's reign (379–395), the pagan temples were destroyed. The lexicographer Hesychius of Alexandria states that in the fifth century there was still a temple and a statue of "Zeus Athonite". After the Islamic conquest of Egypt in the seventh century, many Orthodox monks from the Egyptian desert tried to find another calm place; some of them came to the Athos peninsula. An ancient document states that monks "built huts of wood with roofs of straw [...] and by collecting fruit from the wild trees were providing themselves improvised meals." The chroniclers Theophanes the Confessor (end of eighth century) and Georgios Kedrenos (11th century) wrote that the 726 eruption of the Thera volcano was visible from Mount Athos, indicating that it was inhabited at the time. The historian Genesios recorded that monks from Athos participated at the seventh Ecumenical Council of Nicaea of 787. Following the Battle of Thasos in 829, Athos was deserted for some time due to the destructive raids of the Cretan Saracens. Around 860, the famous monk Efthymios the Younger came to Athos and a number of monk-huts ("skete of Saint Basil") were created around his habitation, possibly near Krya Nera. During the reign of emperor Basil I the Macedonian, the former Archbishop of Crete (and later of Thessaloniki) Basil the Confessor built a small monastery at the place of the modern harbour ("arsanas") of Hilandariou Monastery. Soon after this, a document of 883 states that a certain Ioannis Kolovos built a monastery at Megali Vigla. On a chrysobull of emperor Basil I, dated 885, the Holy Mountain is proclaimed a place of monks, and no laymen or farmers or cattle-breeders are allowed to be settled there. The next year, in an imperial edict of emperor Leo VI the Wise we read about the "so-called ancient seat of the council of gerondes (council of elders)", meaning that there was already a kind of monks' administration and that it was already "ancient". In 887, some monks expostulate to the emperor Leo the Wise that as the monastery of Kolovos is grows more and more, they are losing their peace. In 908 the existence of a Protos ("First monk"), the "head" of the monastic community, is documented. In 943 the borders of the monastic state were precisely mapped; we know that Karyes was already the capital and seat of the administration, named "Megali Mesi Lavra" (Big Central Assembly). In 956, a decree offered land of about 940,000 m2 (230 acres) to the Xeropotamou monastery, which means that this monastery was already quite big. In 958, the monk Athanasios the Athonite (Άγιος Αθανάσιος ο Αθωνίτης) arrived on Mount Athos. In 962 he built the big central church of the "Protaton" in Karies. In the next year, with the support of his friend Emperor Nicephorus Phocas, the monastery of Great Lavra was founded, still the largest and most prominent of the twenty monasteries existing today. It enjoyed the protection of the Byzantine emperors during the following centuries, and its wealth and possessions grew considerably. The Fourth Crusade in the 13th century brought new Roman Catholic overlords, which forced the monks to complain and ask for the intervention of Pope Innocent III until the restoration of the Byzantine Empire. The peninsula was raided by Catalan mercenaries in the 14th century, a century that also saw the theological conflict over the hesychasm practised on Mount Athos and defended by Gregory Palamas (Άγιος Γρηγόριος ο Παλαμάς). In late 1371 or early 1372 the Byzantines defeated an Ottoman attack on Athos. The Byzantine Empire was conquered in the 15th century and the Ottoman Empire took its place. The Athonite monks tried to maintain good relations with the Ottoman Sultans, and therefore when Murad II conquered Thessaloniki in 1430 they immediately pledged allegiance to him. In return, Murad recognized the monasteries' properties, something which Mehmed II formally ratified after the fall of Constantinople in 1453. In this way Athonite independence was somewhat guaranteed. From the account of the Russian pilgrim Isaiah, by the end of the 15th century half of the monasteries were either Slav or Albanian. In particular, Docheiariou, Grigoriou, Ayiou Pavlou, Ayiou Dionysiou, and Chilandariou were Serbian; Karakalou and Philotheou were Albanian; Panteleïmon was Russian; Simonopetra was Bulgarian; Pantokratoros and Stavronikita were Greek; and Zographou, Kastamonitou, Xeropotamou, Koutloumousiou, Xenophontos, Iviron and Protaton did not bear any designation. Sultan Selim I was a substantial benefactor of the Xeropotamou monastery. In 1517, he issued a fatwa and a Hatt-i Sharif ("noble edict") that "the place, where the Holy Gospel is preached, whenever it is burned or even damaged, shall be erected again." He also endowed privileges to the Abbey and financed the construction of the dining area and underground of the Abbey as well as the renovation of the wall paintings in the central church that were completed between the years 1533–1541. Although most time the monasteries were left on their own, the Ottomans heavily taxed them and sometimes they seized important land parcels from them. This eventually culminated in an economic crisis in Athos during the 17th century. This led to the adoption of the so-called "idiorrhythmic" lifestyle (a semi-eremitic variant of Christian monasticism) by a few monasteries at first and later, during the first half of the 18th century, by all. This new way of monastic organization was an emergency measure taken by the monastic communities to counter their harsh economic environment. Contrary to the cenobitic system, monks in idiorrhythmic communities have private property, work for themselves, they are solely responsible for acquiring food and other necessities and they dine separately in their cells, only meeting with other monks at church. At the same time, the monasteries' abbots were replaced by committees and at Karyes the Protos was replaced by a four-member committee. In 1749, with the establishment of the Athonite Academy near Vatopedi monastery, the local monastic community took a leading role in the modern Greek Enlightenment movement of the 18th century. This institution offered high level education, especially under Eugenios Voulgaris, where ancient philosophy and modern physical science were taught. Russian tsars, and princes from Moldavia, Wallachia and Serbia (until the end of the 15th century), helped the monasteries survive with large donations. The population of monks and their wealth declined over the next centuries, but were revitalized during the 19th century, particularly by the patronage of the Russian government. As a result, the monastic population grew steadily throughout the century, reaching a high point of over 7,000 monks in 1902. In November 1912, during the First Balkan War, the Ottomans were forced out by the Greek Navy. Greece claimed the peninsula as part of the peace treaty of London signed on 30 May 1913. As a result of the shortcomings of the Treaty of London, the Second Balkan War broke out between the combatants in June 1913. A final peace was agreed at the Treaty of Bucharest on 10 August 1913. In June 1913, a small Russian fleet, consisting of the gunboat Donets and the transport ships Tsar and Kherson, delivered the archbishop of Vologda, and a number of troops to Mount Athos to intervene in the theological controversy over imiaslavie (a Russian Orthodox movement). 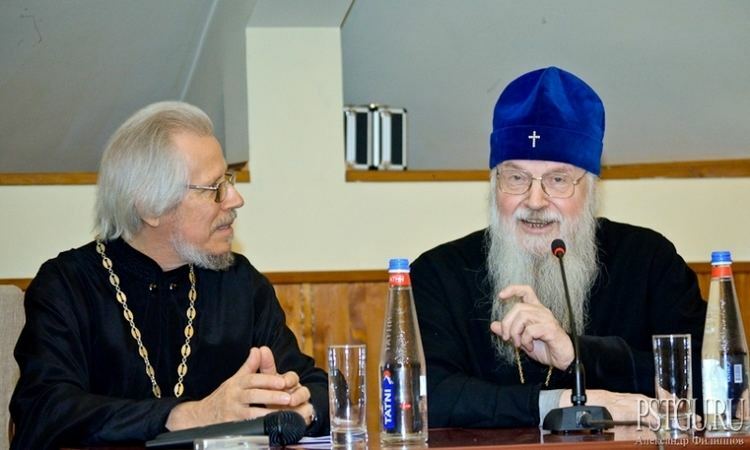 The archbishop held talks with the imiaslavtsy and tried to make them change their beliefs voluntarily, but was unsuccessful. On 31 July 1913, the troops stormed the St. Panteleimon Monastery. Although the monks were not armed and did not actively resist, the troops showed very heavy-handed tactics. After the storming of St. Panteleimon Monastery, the monks from the Andreevsky Skete (Skiti Agiou Andrea) surrendered voluntarily. The military transport Kherson was converted into a prison ship and more than a thousand imiaslavtsy monks were sent to Odessa where they were excommunicated and dispersed throughout Russia. The self-governed region of the Holy Mountain, according to the Decree passed by the Holy Community on 3 October 1913 and according to the international treaties of London (1913), Bucharest (1913), Neuilly (1919), Sèvres (1920) and Lausanne (1923), is considered part of the Greek state. The Decree, "made in the presence of the Holy Icon of Axion Estin", stated that the Holy Community recognised the Kings of Greece as the lawful sovereigns and "successors on the Mountain" of the "Emperors who built" the monasteries and declared its territory as belonging to the then Kingdom of Greece. Political instability in Greece during the mid-20th century that affected Mount Athos included Nazi occupation from the Easter season of 1941 through late 1944, followed immediately by the Greek Civil War in a struggle where Communist efforts failed. The Battle of Greece was reported in Time magazine, "The Stukas swooped across the Aegean skies like dark, dreadful birds, but they dropped no bombs on the monks of Mount Athos". After the Nazi takeover of Greece, the Epistassia, Athos's four-member executive committee, formally asked Hitler to place the Autonomous Monastic State under his personal protection, and Hitler agreed. Mount Athos survived World War II nearly untouched, and for the remainder of the war, the monks of Mount Athos referred to Adolf Hitler as "High Protector of the Holy Mountain" (German: Hoher Protektor des heiligen Berges). Later a "Special Double Assembly" of the Holy Community in Karyes passed the constitutional charter of the Holy Mountain, which was ratified by the Greek Parliament. This regime originates from the "self-ruled monastic state" as stated on a chrysobull parchment signed and sealed by the Byzantine Emperor Ioannis Tzimisces in 972. This important document is preserved in the House of the Holy Administration in Karyes. The self-rule of the Holy Mountain was later reaffirmed by the Emperor Alexios I Komnenos in 1095. According to the constitution of Greece, Mount Athos (the "Monastic State of Agion Oros") is, "following ancient privilege", "a self-governed part of the Greek State, whose sovereignty thereon shall remain intact", and consists of 20 main monasteries which constitute the Holy Community, and the capital town and administrative centre, Karyes, also home to a governor as the representative of the Greek state. The governor is an executive appointee. The status of the Holy Mountain and the jurisdiction of the Agiorite institutions were expressly described and ratified upon admission of Greece to the European Union (then the European Community). On 11 September 2004, the Eastern Orthodox Patriarch of Alexandria, Peter VII, was killed, together with 16 others, when a Greek military Chinook helicopter in which he was travelling crashed in the Aegean Sea off the peninsula. The Patriarch was heading to Mount Athos. The cause of the crash remains unknown. The monasteries of Mount Athos have a history of opposing ecumenism, or movements towards reconciliation between the Orthodox Church of Constantinople and the Roman Catholic Church. The Esphigmenou monastery is particularly outspoken in this respect, having raised black flags to protest against the meeting of Patriarch Athenagoras I of Constantinople and Pope Paul VI in 1972. Esphigmenou was subsequently expelled from the representative bodies of the Athonite Community. The conflict escalated in 2002 with Patriarch Bartholomew I of Constantinople declaring the monks of Esphigmenou an illegal brotherhood and ordering their eviction; the monks refused to be evicted, and the Patriarch ordered a new brotherhood to replace them. After reaching a low point of just 1,145 mainly elderly monks in 1971, the monasteries have been undergoing a steady and sustained renewal. By the year 2000, the monastic population had reached 1,610, with all 20 monasteries and their associated sketes receiving an infusion of mainly young well-educated monks. In 2009, the population stood at nearly 2,000. Many younger monks possess university education and advanced skills that allow them to work on the cataloging and restoration of the Mountain's vast repository of manuscripts, vestments, icons, liturgical objects and other works of art, most of which remain unknown to the public because of their sheer volume. Projected to take several decades to complete, this restorative and archival work is well under way, funded by UNESCO and the EU, and aided by many academic institutions. Athos is governed by the "Holy Community" (Ιερά Κοινότητα – Iera Koinotita) which consists of the representatives of the 20 Holy Monasteries, having as executive committee the four-membered "Holy Administration" (Ιερά Επιστασία – Iera Epistasia), with the Protos (Πρώτος) being its head. Civil authorities are represented by the Civil Governor, appointed by the Greek Ministry of Foreign Affairs, whose main duty is to supervise the function of the institutions and the public order. The current Civil Governor is Aristos Kasmiroglou. In each of the 20 monasteries – which today all follow again the coenobitic system – the administration is in the hands of the Abbot (Ηγούμενος – Hēgoumenos) who is elected by the brotherhood for life. He is the lord and spiritual father of the monastery. The Convention of the brotherhood (Γεροντία) is the legislative body. All the other establishments (sketes, cells, huts, retreats, hermitages) are dependencies of some of the 20 monasteries and are assigned to the monks by a document called homologon (ομόλογον). All persons leading a monastic life thereon acquire Greek citizenship without further formalities, upon admission as novices or monks. Visits to the peninsula are possible for laymen, but they need a special permit known as a diamonētērion (διαμονητήριον), similar to a visa. Of the 20 monasteries located on the Holy Mountain, the brethren of 17 are predominantly ethnically Greek. Of the other 3, brethren are drawn from monks of primarily other origins, who become Greek subjects. These are the Helandariou Monastery (Serbian), the Zografou Monastery (Bulgarian) and the Agiou Panteleimonos Monastery (Russian). Among the sketes, most are predominantly ethnic Greek. However, two are Romanian, the coenobitic "Skētē Timiou Prodromou" (which belongs to the Megistis Lavras Monastery) and the idiorrythmic "Skētē Agiou Dēmētriou tou Lakkou", also called "Lakkoskētē" (which belongs to the Agiou Pavlou Monastery). Another one is Bulgarian, "Skētē Bogoroditsa" (which belongs to the Agiou Panteleimonos Monastery). Entry to the mountain is usually by ferry boat either from the port of Ouranoupoli (for west coast monasteries) or from Ierrisos for those on the east coast. Before embarking on the boat all visitors must have been issued a diamonētērion (διαμονητήριον), a form of Byzantine visa that is written in Greek, dated using the Julian calendar, and signed by four of the secretaries of leading monasteries. Clergy of the Orthodox Church are required to obtain permission of the Patriarch of Constantinople. 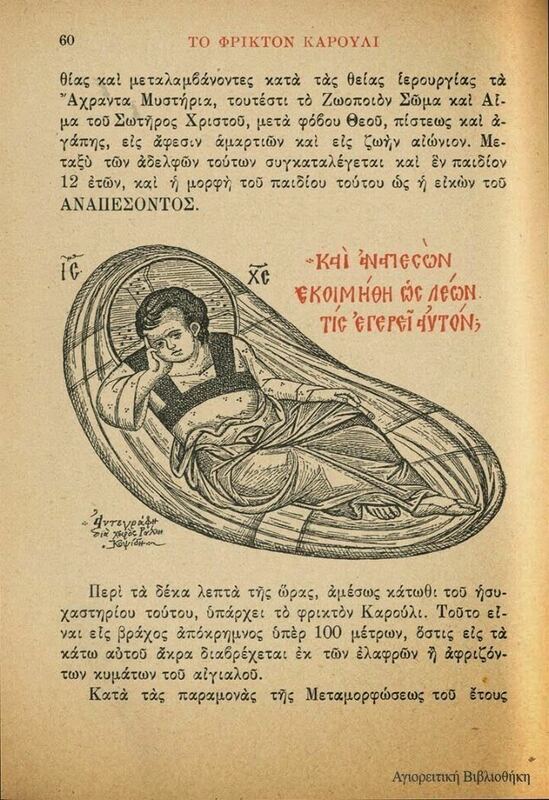 For laymen there are generally two kinds of diamonētēria: the general diamonētērion that enables the visitor to stay overnight at any one of the monasteries but only to stay in the mountain for several days (more in winter, when there are fewer visitors, than in summer), and the special diamonētērion which allows a visitor to visit only one monastery or skete but to stay as many days as he has agreed with the monks. Laymen are required to have short hair and any non-cleric arriving on Athos with long hair has his hair cut. The general diamonētērion is available upon application to the Pilgrims' Bureau in Thessaloniki. Once this has been granted it will be issued at the port of departure, on the day of departure. Once granted, the pilgrim can contact the monastery where he would like to stay in order to reserve a bed (one night only per monastery). The ferries require reservations, both ways. The duration of the general visa can be extended by several days by personally applying at the main office in Karyes or, as is done typically for someone seeking to become a monk, by a request from a monastery. Most visitors arrive at the small port of Dafni from where they can take the only paved road in the mountain to the capital Karyes or continue via another smaller boat to other monasteries down the coast. There is a public bus between Dafni and Karyes. Expensive taxis operated by monks are available for hire at Dafni and Karyes. They are all-wheel drive vehicles since most roads in the mountain are unpaved. Visitors to monasteries on the mountain's western side prefer to stay on the ferry and disembark at the monastery they wish to visit. There is a prohibition on entry for women, called avaton (Άβατον) in Greek, to make living in celibacy easier for men who have chosen to do so. Monks feel that the presence of women alters the social dynamics of the community and therefore slows their path towards spiritual enlightenment. The ban was officially proclaimed by several emperors, including Constantine Monomachos, in a chrysobull of 1046. In the 14th century, Serbian Emperor Dušan the Mighty brought his wife, Helena of Bulgaria, to Mount Athos to protect her from the plague, but she did not touch the ground during her entire visit, as she was carried in a hand carriage all the time. French writer Maryse Choisy entered Mount Athos in the 1920s disguised as a sailor, and later wrote about her escapade in Un mois chez les hommes ("A Month With Men"). There was an incident in the 1930s regarding Aliki Diplarakou, the first Greek beauty pageant contestant to win the Miss Europe title, who shocked the world when she dressed up as a man and sneaked into Mount Athos. Her escapade was discussed in the 13 July 1953, Time magazine article entitled "The Climax of Sin". A 2003 resolution of the European Parliament requested the lifting of the ban for violating "the universally recognised principle of gender equality". Female animals, chickens, cows, ewes, nanny-goats, mares, and sows are also barred except for female cats, female insects and female songbirds. As part of an EU member state, Mount Athos is part of the European Union and, for the most part, subject to EU law. While outside the EU's Value Added Tax area, Mount Athos is part of the Schengen Area. A declaration attached to Greece's accession treaty to the Schengen Agreement states that Mount Athos' "special status" should be taken into account in the application of the Schengen rules. The monks strongly objected to Greece joining the Schengen Area based on fears that the EU would be able to end the centuries-old prohibition on the admittance of women. The prohibition is unchanged and a special permit is required to enter the peninsula. The monks are also worried that the agreement could affect their traditional right to offer sanctuary to people from Orthodox countries such as Russia. Such monks do nowadays need a Greek visa and permission to stay, even if that is given generously by the Greek ministry, based on requests from Athos. The Athonite monasteries possess huge deposits of invaluable medieval art treasures, including icons, liturgical vestments and objects (crosses, chalices), codices and other Christian texts, imperial chrysobulls, holy relics etc. However the monks consider them for their religious function only, not as "treasures" and most are in regular use for their original purpose. Until recently no organized study and archiving had been carried out, but an EU-funded effort to catalogue, protect and restore them is underway since the late 1980s. Their sheer number is such, it is estimated that several decades will pass before the work is completed. Among the most ancient and priceless codices at Mount Athos are the Codex Athous Lavrensis and the Codex Athous Dionysiou. Greek is commonly used in all the Greek monasteries, but in some monasteries there are other languages in use: in Agiou Panteleimonos, Russian (67 monks in 2011); in Helandariou Monastery, Serbian (58); in Zographou Monastery and Skiti Bogoroditsa, Bulgarian (32); and in the sketes of Timiou Prodromou and Lakkoskiti, Romanian (64). Today, many of the Greek monks also speak foreign languages. Since there are monks from many nations in Athos, they naturally also speak their own native languages. The Julian calendar, which currently has a difference of 13 days from the Gregorian calendar, is still used on Mount Athos. In 1923, as a means to eliminate the divergence existing between the religious and civil dates, after a synod in Constantinople, part of the Eastern Orthodox Churches dropped 13 days and adopted the Revised Julian calendar, which is synchronised with the Gregorian calendar, at least until 2800. Although under the direct jurisdiction of the Ecumenical Patriarchate of Constantinople, the spiritual head of the monastic state, nearly all the monasteries of Athos refused to follow the revised calendar and finally, for the sake of uniformity, the patriarch asked the single monastery that used the revised calendar to revert to the Julian. Also in use is Byzantine time, in which the day commences at sunset as does the liturgical day and not at midnight as in the reckoning of civil time, and the difference between the two varies according to the season of the year. Because the time interval from sundown to sundown is not constant, clocks showing the Byzantine time require continual manual readjusting which in current practice is done weekly, on Saturday, if the sky is clear; where the summit of Athos is visible, 12:00 is set when the last rays of sunlight cease to shine on the tip. Some monasteries also have a clock showing civil time since boat schedules run thereon (and on the civil calendar) as well as for pilgrims who may be disoriented by Byzantine time reckoning. As described above, today the 20 monasteries of Mount Athos are the dominant holy institutions for both spiritual and administrative purposes, consolidated by the Constitutional Chart of the Holy Mountain. Although, since the beginning of Mount Athos' history, monks were living in lodgings of different size and construction quality. All these monastic lodging types exist until today, named as seats (καθίσματα), cells (κελλιά), huts (καλύβες), retreats (ησυχαστήρια), hermitages (ερημιτήρια), caves (σπήλαια), sketai (σκήτες) and all of them are known under the general term "dependencies" (εξαρτήματα) of the Holy Monasteries. The term "cells" can be used under a more generalised meaning, comprising all the above but sketae, and following this term we can talk about three different kind of institutions in Mount Athos: monasteries, sketae and cells. Some information is already given above, in the section "Administration and organization". A pilgrim/visitor to a monastery, who is accommodated in the guest-house (αρχονταρίκι) can have a taste of the monastic life in it by following its daily schedule: praying (services in church or in private), common dining, working (according to the duties of each monk) and rest. During religious celebrations usually long vigils are held and the entire daily program is radically reshaped. The gate of the monastery closes by sunset and opens again by sunrise. A cell is a house with a small church, where 1–3 monks live under the spiritual and administrative supervision of a monastery. Monastic life in the cells is totally different from that in a monastery. Some of the cells resemble tidy farmhouses, others are poor huts, others have the gentility of Byzantine tradition or of Russian architecture of the past century. Usually, each cell possesses a piece of land for agricultural or other use. Each cell has to organize some activities for income. Besides the traditional occupations (agriculture, fishing, woodcarving, spirit distillation, iconography, tailoring, book binding etc.) new occupations have been taken up, for example taxi driving, couriers, car repairing and computer services. The monk(s) living in a cell, having to take care of all daily chores, make up their own schedules. For the pilgrim/visitor it is worth experiencing this side of monastic life as well, but most of the cells have very limited or no capacity for hospitality. Small communities of neighbouring cells were developed since the beginning of monastic life on Mount Athos and some of them were using the word "skete" (σκήτη) meaning "monastic settlement" or "lavra" (λαύρα) meaning "monastic congregation". The word "skete" is of Coptic origin and in its original form is a placename of a location in the Egyptian desert. It is in the Egyptian desert where monasticism made its first steps. The unknown author of the "History of the Egyptian Monks" (Historia Monachorum in Aegypto), perhaps Flavius Rufinus visited the area at the end of the fourth century. He tells us: "Then we came to Nitria, the best-known of all monasteries of Egypt, about forty miles [60 km] from Alexandria; it takes its name from a nearby town where Nitre is collected... In this place there are about fifty dwellings, or not many less, set near together and under one father. In some of them, there are many living together, in others a few and in some there are brothers who live alone. Though they are divided by their dwellings they remain bound together and inseparable in faith and love". This is exactly the main idea of a "skete", the communal way, just between the eremitic way and the coenobitic way of monasticism, with all 3 coexisting until today. In 1680 the ex-patriarch Dionysios III Vardalis built in the Saint Anne skete of the Holy Mountain a big central church to accommodate all the monks of the area and in 1689 an internal regulatory text was constituted by the monks and ratified first by the Monastery of Megisti Lavra and finally by the patriarch Dionysios V Haritonidis; and later again by patriarch Kyrilos V, who contributed in its evolution. Since then, more sketes followed on the same way, and gradually the term "skete" (within the Holy Mountain) came to be used only for the monastic settlements having an internal rule ratified by the Patriarchate. Later on, some cells came to attract many monks, expanded their buildings and started functioning in the coenobitic way of the monasteries. Since the number of the Monasteries in Mount Athos was restricted to 20, a new term was introduced: the coenobitic skete (κοινόβιος σκήτη), while a skete of the traditional form was named idiorhythmic skete (ιδιόρρυθμος σκήτη) in order to underline the difference. The first ones, both in architecture and lifestyle, follow the typical model of a monastery, that of a community living together, sharing and distributing work, and praying together daily. In contrast, the idiorrhythmic community (intermediary between the coenobitic community and the seclusion of a hermit) resembles a hamlet, and the daily life there is much like that of a cell. But there are also some duties for the community. Near the centre of the settlement is the central church called Kyriakon (Κυριακόν, that could be translated "for Sunday"), where the whole brotherhood meets for the Divine Liturgy service, on Sundays and on greater feasts. Usually there are also an administration house, a refectory for common celebrations, a cemetery, a library, storehouses and a guesthouse. A skete is a community of Christian hermits following a monastic rule, allowing them to worship in comparative solitude, while also affording them a level of mutual practical support and security. There are two kinds of sketes in Mount Athos. A koenobitic skete follows the style of monasteries. An idiorrhythmic skete follows the style of a small village: it has a common area of worship (a church), with individual hermitages or small houses around it, each one for a small number of occupants. There are twelve official sketes on Mount Athos. The Friends of Mount Athos (FoMA) is a society formed in 1990 by people who shared a common interest for the monasteries of Mount Athos. Timothy Ware, Metropolitan Kallistos of Diokleia, is the President and Chairman of the society. Among its members are Prince Philip, Duke of Edinburgh and Charles, Prince of Wales, Heir Apparent to the British throne. The object of the society, as stated on its official web page, is officially described as: "the advancement of education of the public in the study and knowledge of the history, culture, arts, architecture, natural history, and literature of the Orthodox monasteries of Mount Athos and the promotion of the religious and other charitable work of the Holy Community and monasteries of Mount Athos." In keeping with those objects, the society is empowered "to make grants, donations and other payments for the restoration or conservation of buildings or of works of art and books of educational or religious significance on Mount Athos within the above objects." To that end the society produces publications, arranges lectures, and organizes conferences and exhibitions devoted to Athonite themes. Among the society's publications are its annual bulletin (Friends of Mount Athos Annual Report) offering articles, book reviews and other features related to Mount Athos. It also publishes A Pilgrim's Guide to Mount Athos as well as a yearly directory of members.